Jacksonville resident serves as local organizer for national health movement. Walking is a good form of exercise and can help you reach your fitness and weight-loss goals. Decked out in colorful tights, running shoes and matching blue T-shirts, a merry band of sisters meet up every Saturday morning in Jacksonville’s century-old Memorial Park. They congregate around the park’s globe-shaped bronze statue to snap selfies and swap stories before setting off for roundtrip walks to the Jacksonville Landing or the Maxwell House Coffee plant on East Bay Street. Earlier this year, the group, led by Baptist Health team member Sharon Rashad, decided to take it up a notch by walking approximately eight miles, from Memorial Park to TIAA Bank Field, home of the Jacksonville Jaguars. “I said, ‘Let’s walk until we touch the Jaguars statue in front of the football stadium,’” recalled Rashad, a construction finance coordinator in Design and Construction. A mother of two grown sons, Rashad was looking for a group fitness activity that the women in her church, New Mount Moriah A.M.E., could be involved with when she came across GirlTrek, a national movement grounded in civil rights history and principles and focused on the health and well-being of black women. According to the Centers for Disease Control and Prevention (CDC), 80 percent of black women are overweight or obese – surpassing every other demographic group in the nation. Black women also face elevated risk for stroke and high blood pressure, and one in four over the age of 55 has diabetes, the CDC said. Former First Lady Michelle Obama is among GirlTrek’s nearly 160,000 registered members. “When we decided to focus on walking as a form of exercise, the women in my church were onboard right away,” said Rashad, who leads a health ministry at New Mount Moriah, where her husband, Sha’Reff, is the pastor. But Rashad didn’t stop there. She introduced GirlTrek to a dozen African Methodist Episcopal churches in the area, and spoke about the topic at the annual A.M.E. Church Conference in Jacksonville. In April, she helped Baptist Health host its first GirlTrek event at Ribault High School. Rashad moved to Jacksonville in 1998 after her husband, a retired master chief petty officer, was transferred to Naval Air Station Jacksonville for his final duty assignment. The couple’s two sons, Shareff II, 31, and Shakeel, 25, both played football at Episcopal High School and collegiately at the University of Central Florida and the University of North Carolina, respectively. Since coming to Baptist in April 1999, Rashad has participated in a number of volunteer endeavors. She served as a Tipping the Scale summer employment mentor from 2014-2016 and has served as treasurer of the annual Wolfson Children’s Hospital bass tournament since 2013. She recently became a year-round Tipping the Scale mentor. “I’m also a Spirit of Caregiving facilitator. How could I forget that,” she added. One of Rashad’s most memorable GirlTrek accomplishments occurred last Thanksgiving in Summerville, S.C., when she talked approximately 60 of her family members into participating in an informal 5K (3.1-mile) walk to celebrate her grandfather’s 102nd birthday. 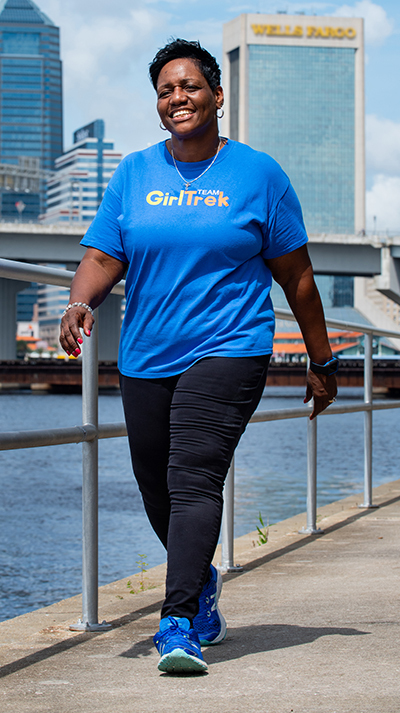 Since becoming a GirlTrek organizer in 2016, Rashad has inspired more than 80 other black women to join the growing health movement, including Lynn Sherman, director of Community Engagement for Baptist Health. Interested in applying for a community health program or project in Northeast Florida? Contact Lynn Sherman of Baptist Health at 904.202.5112 to learn more.